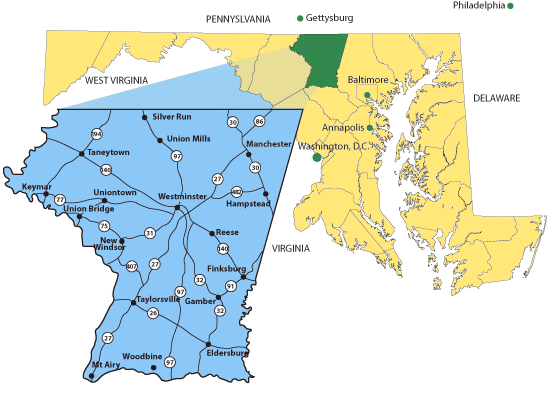 Carroll County, Maryland, is a growing community centrally located in the Baltimore/Washington, D.C., metropolitan region. Its close proximity to Philadelphia, Richmond, New York and Boston make it a prime location for a variety of industrial users. Eight municipalities comprise our county – Westminster, Taneytown, Union Bridge, New Windsor, Mt. Airy, Sykesville, Hampstead and Manchester. Carroll County features affordable housing, an exceptional quality of life and a well-trained and highly skilled labor force – that’s why nearly 5,000 businesses call Carroll County home. Carroll County Government’s GIS Division develops and maintains spatial information to aid in the creation of maps and data analysis to support County agencies and their customers. Maps on the Web has been created to provide citizens with access to map information about Carroll County. These maps have been grouped into three categories: viewable, interactive, and aerial photo images.